GRAND BLANC — Dort Federal Credit Union is excited to announce the results of their 2018 Annual Snowman Sales fundraiser benefiting local charities. The 2018 beneficiaries, selected by Dort Federal Credit Union employees, will split proceeds totaling $23,178.50 between the the Old Newsboys of Flint and Ele’s Place. On Jan. 24, Dort Federal Credit Union presented The Old Newsboys of Flint with a check in the amount of $11,589.25. “It is very important for us to have corporate sponsors, such as Dort Federal Credit Union, to help make the Holidays brighter for needy children in our community,” said Old Newsboys of Flint Executive Director Chris Hamilton. 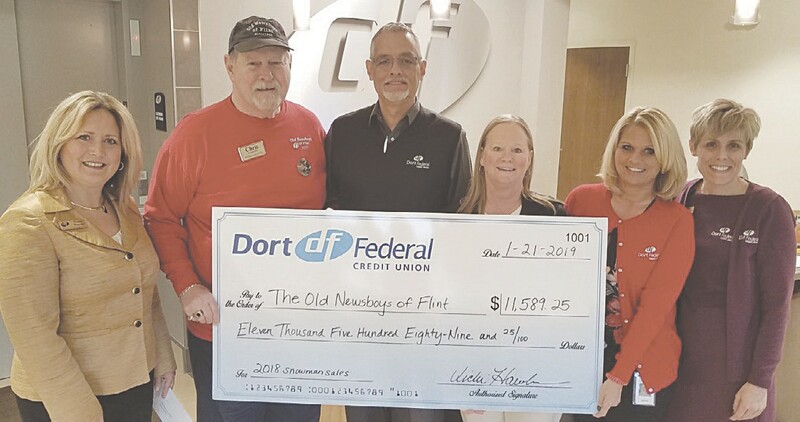 Dort Federal Credit Union has contributed to the Annual Snowman Sales campaign through donations received from members throughout the holiday season for over 20 years. Dort Federal’s employees and Board of Directors also contributed more than $7,500 to the campaign throughout the year. — G.G.